General discussions on sequential analysis are presented in Sequential Analysis Explained and will not be repeated here. This page briefly explains the Triangular Test that was developed in the late 1980s and 1990s by Whitehead. For those interested in obtaining a full understanding of the theories and methodologies of the Triangular Test, Whitehead's text book (see reference) is highly recommended. 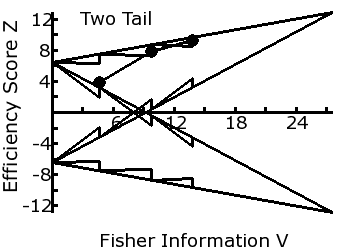 The Triangular test is a sequential statistical method for comparing two groups, based on the relationship between Fisher's information V (expression of the quantity of data) and the efficiency score Z (expression of the effect size). The calculation of V and Z depends on the nature of the measurements concerned, but the interpretations of their relationship are the same. V and Z can be calculated at any time during the study. Statistical borders are drawn that allows the researcher to make one of 3 decision whenever the data is reviewed. These are to continue with the experiment, to reject the null hypothesis and stop the experiment, or to accept the null hypothesis and stop the experiment. The baseline and two borders forms a triangle. While the V / Z plot remains within the triangle, no decision should be made other than to collect more data. If the plot crosses the outer border, then the null hypothesis can be rejected (significant difference exists). If the plot crosses the inner border than the null hypothesis can be accepted (no significant difference). The primary straight line borders are calculated on the assumption that the data will be reviewed after the data is obtained from each case as they become available. These borders are narrowed to become more powerful if the data are reviewed less frequently, the extent of the narrowing depending on the sample size between the reviews. The final borders, with periodic narrowing, looks like a Christmas tree. Please note that the coordinates defined in these pages are based on a 2 tailed test (detecting a difference in either direction). If a one tail test is to be used (one group more than the other but not interested if it is the other way around) then the type I Error (α) used should be doubled (eg. 0.1 instead of 0.05), and the stopping borders not related to the null hypothesis deleted from the plot. Please also note that the stopping borders are not affected by the ratio of sample size between the two groups, as these are calculated from α, β(1-power), and the effect size θ. Discrepancies between the two sample sizes however affects the calculation of V and Z from the data, so will alter the predicted sample size requirement at the planning stage. At the end of the analysis, a termination test can be done by calculating the final effect size Theta T=Z/sqrt(V). For the null hypothesis, T0=0 and SD(T0)=sqrt(V). The normalized z test can therefore be used to test whether T deviates from null. In his book, Whitehead presented 5 models, for normally distributed means, Poisson distributed counts, binomially distributed proportions, survival rates, and non-parametric ordinal arrays. These are discussed individually as in the following sections. β : is the probability of Type II Error. Commonly, β<0.2 is used at the planning stage to determine sample size or calculating borders for sequential analysis. θ : or theta, is used at the planning stage of a study and represents the effect size, the difference detectable in the experimental model being planned. How θ is calculated depends on the nature of the data. The sample size required in a fixed sample size model or the stopping border in a sequential model are calculated using α, β, and θ. Ratio : is the planned ratio of case allocation between the two groups (ratio = n1 / n2). Ratio alters the power of the study, so will alter the sample size required in a fixed sample study, and the estimated maximum sample size required in a sequential study. However, ratio does not affect the coordinates of the stopping border in the sequential analysis. The formulae Z = a + cV are the stopping borders, calculated from α, β, and θ, according to equations eq 4.6 and 4.7, p 77	. Two such lines are drawn, one to make the decision to reject the null hypothesis and the other to make the decision to accept the null hypothesis. These lines are calculated on the assumption that the data is review after every case, and are modified if data are reviewed less frequently. A symmetrical and inverse set of these equations are also presented in the two tailed model. The significant and not significant values are not the same as the borders drawn at the time of planning, but are also governed by the number of cases between each review. In the two tailed model, two sets of borders and significant values are calculated, one for group 1 > group 2 (borders above the x axis), and the other for group 1 < group 2 (borders below the x axis). In the one tailed model, one set of these borders is irrelevant and should be removed. The Type I Error parameter needs to be doubled (e.g. use 0.1 instead of 0.05). This will reduce the sample size needed. The two results tables should be modified, the significant borders representing the side that is not in the model should be deleted. The bitmap needs to be modified, so that the half (top or bottom) of the plots not in the model is deleted. This can be done after the initial calculation, by tweaking the MacroPlot codes (removing those rows that plot the unnecessary lines and rescale the bitmap). The lower borders are now irrelevant and can be removed, the plot can then be rescaled. Ratio of the two groups sizes: The default value for the ratio is 1, that there is an equal allocation to the two groups, but this may not be suitable in situation where one group needs to be very much bigger than the other (for example, when one of the experimental treatments is dangerous or expensive, and a 2 to 1 or 3 to 1 ratio of case allocation to the two groups is planned). When the sample sizes are substantially different, the maximum sample size required and the decision borders are affected, particularly where the model is two counts, two proportions, or two survivals. In these cases the one sided model should be used, as the decision borders for the two sides of the model (group 1>group 2 or group 1 < group 2) are not the same. Lamda (λ) : is the averaged event rate (λ=k/n) where k is the observed number of events (pregnancy, asthma attacks, car crashes, falls, number of cells), and n is number of units of observation (number of women years, number of children months, per thousand cars per year, per hundred beds per month in a hospital, number of microlitres of body fluid). λ1 and λ2 are the event rates of group 1 and 2 the study is design to detect. The data : are in 4 columns, separated by spaces or tabs. They are the number of units of observation and number of events observed in group 1, followed by that in group 2 (n1 k1 n2 k2). Each row represents the accumulated numbers found at each review, in temporal order. We wish to compare a special breathing exercise against no exercise as they affect the frequency of asthma attacks in children. We will conclude that the exercise reduces asthma attack if it can half the frequency from 20 per 100 children months to 10. We therefore set the two λ values to 20 asthma attacks per 100 children months (λ1=0.2) for the control group, and 10 (λ2=0.1) for the exercise group. We designate α=0.05 and power=0.8, and will allocate the case into two equal size groups (r=1). The borders as calculated are shown above and to the right. We recruited the research subjects, and randomized them into two groups to receive or not receive the exercise. After completion of the treatment (or equivalent time if not treated), the child is followed up for 1 month, and any asthmatic attack is recorded. The plan is to review the data available every 2 months until the study is completed. The results at the end of 6 months (third reviews) are presented in the table to the left, and the Triangular plot shown to the right. As the test is 2 sided, two triangles, one for group 1>group 2, and the other for group 2>group 1. The straight line borders are for use if the data is reviewed after every case, and the inward Christmas tree like narrowing are border adjustments when there are more than 1 case added between reviews, the extent of the narrowing depends on the sample size between reviews. The relationship between V and Z are shown in the line joining the dots. At the first review at 2 months, there were 50 children months in the control group who had between them 10 asthma attacks (λ=10/50=0.2), and 53 children months who received the exercise who had 8 asthma attacks between them (λ=8/53=0.15) (V=4.5 , Z=-1.3). The resulting plot was within the borders, and the decision was to continue to collect data. At the second review at 4 months, the number of completed cases have increased. There were now 100 children months in the control group who had between them 18 asthma attacks (λ=18/100=0.18), and 99 children months who received the exercise who had 15 asthma attacks between them (λ=15/99=0.15). (V=8.2 , Z=-1.4).As the resulting plot remained within the borders, the decision was to continue to collect data. At the third review at 6 months, there were now 150 children months in the control group who had between them 28 asthma attacks (λ=28/150=0.19), and 160 children months who received the exercise who had 25 asthma attacks between them (λ=25/160=0.16). (V=13.2 , Z=-2.4).The plot now traversed both inner borders, and the study could be terminated, with the conclusion drawn that the incidents of asthma in the two groups were not significantly different. The terminal analysis showed effect size(Z/sqrt(V))=0.6473, p=0.2587. The sample size for the two groups combined was 310, less than half of the maximum number of cases required for the Triangular Test, and well short of the 436 cases sample size if the study was to be a fixed sample one. This is because the difference between the two groups in reality was very much less than anticipated, and the null hypothesis could be accepted earlier. Difference Between means = mean(group 1) - mean(group 2). The study is then designed to detect this difference. Within Group Standard Deviation (SD) is the expected background or population Standard Deviation. This is usually not available at the planning stage, and some sort of guesstimate is commonly used. The data are in 6 columns, separated by spaces or tabs. They are sample size, mean, and Standard Deviation found in group 1, followed by the same for group 2 (n1 mean1 SD1 n2 mean2 SD2). Each row represents the accumulated numbers found at each review, in temporal order. We wish to compare the at term birth weight of babies, between boys and girls. We assume that birth weights are normally distributed, with a standard deviation of 0.3Kgs. We would be happy to decide that boys weighed more than girls if the difference is 0.2kg or more. We designate α=0.05 and power=0.8, and will anticipate that the number of boys and girls delivered are roughly the same so we set the ratio to 1. The borders as calculated are shown above and to the right. We decided to weigh all the babies (in Kgs) delivered each week, and review the data weekly. The results at the end of 3 weeks (third reviews) are presented in the table to the left, and the Triangular plot shown to the right. As the test is 2 sided, two triangles, one for boys>girls, and the other for girls>boys. At the first review after 1 week, there were 10 boys with mean=3.8 and sd=0.2, and 10 girls mean 3.6 and sd=0.3, V=4.6 and Z=3.8. The resulting plot has reached the inner border of the lower triangle, and at this point the conclusion that girls are not significantly heavier than boys could be drawn. However the plot was still within the borders of the upper triangle, so no decision could be made as to whether boys are heavier than girls, so the correct decision was to continue to collect data. At the second review after 2 weeks, the number of babies delivered has increased. There were now 20 boys with mean=3.7 and sd=0.3, and 22 girls with mean=3.5 and sd=0.2, V=9,7 and Z=7.9. The plot has now reached the adjusted border, and at this point the study could and should have stopped, and the conclusion that boys are heavier than girls could be made. The extension of the study to the third week was unnecessary, and it merely confirmed the finding of the second review. The terminal analysis at the end of the second week showed effect size(Z/sqrt(V))=2.5255 p= 0.0058. The sample size at that time was 20, less than the 110 maximum required and well short of the 71 cases required for a fixed sample size study. The data : are in 4 columns, separated by spaces or tabs. They are numbers positive in group 1 and group 2, then numbers negative in group 1 and group 2 (n1(pos) n2(pos) n1(neg) n2(neg)). Each row represents the numbers found at each review, in temporal order. The transport department noticed that only 20% of teenagers pass their driving test in the first attempt. It was decided to introduce a training course, but this is expensive, so the department wishes to go ahead only if this can increase the pass rate to at least 50%. We designate α=0.05 and power=0.8, the two proportions 0.5 and 0.2, and set the ratio of the two groups to 1. The borders as calculated are shown above and to the right. Teenagers were recruited to the trial as they applied for testing, and randomly allocated to training before the test. A decision to review the result monthly was made. The results at the end of 3 months (third reviews) are presented in the table to the left, and the Triangular plot shown to the right. As the test is 2 sided, two triangles, one for trained>controls, and the other for controls>trained. At the first review after 1 month, there were 8 teenagers trained, and 4(50%) passed the driving test. There were 9 controls and 2 (22%) passed. (V=0.97, Z=1.18). The Triangular Test plot at this time impinged on the inner border of the lower triangle, so a conclusion that those trained did not do worse than the control could be made. However the plot was within the upper triangle, so no conclusion could be made whether those trained did better, so data collection had to continue. At the second review after 2 months, the number trained was 15 and 7 (47%) passed. There were 15 controls 4(27%) of whom passed. (V=1.74, Z=1.50). The plot remained within the upper triangle so data collection continues. As the plot was nowhere near the border, it was decided to improve the power by not reviewing the data at the 3rd month, rather to do so in 2 month's time at month 4. At the third review 4 months after the study began, the number trained was 30 and 15 (50%) of whom passed the test. There were also 30 controls, 6 (20%) of whom passed. (V=3.41 , Z=4.50). The plot now crosses the adjusted outer border of the upper triangle, so the study can be terminated, and the conclusion made that the training course significantly improved the pass rate of the test. The terminal analysis at the end of the second week showed effect size(Z/sqrt(V))=2.436 p= 0.007. The sample size at that time was 60, less than the 112 maximum required and short of the 72 cases required for a fixed sample size study. Number of divisions is the number of cells in the arrays to be compared. Examples are 3 division in some pain scale (0=no pain, 1=some pain, 2=severe pain) or the 5 division Likert Scale (0=Strongly Disagree, 1=Disagree, 2=Neutral, 3=Agree, and 4=Strongly Agree). 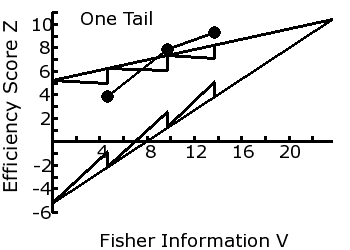 Expected Proportions is the table of expected proportions with two columns for the two groups, and the number of rows the number of divisions. Each cell contains the proportion or probability for that division in that group, so that each column sums to the totality of 1. This defines what the study is designed to detect. The data : are in 2 columns, separated by spaces or tabs. The number of rows is the multiple of the number of reviews and number of divisions (rows=reviews x divisions) Each cell contains the number of cases in that group for that division in that review. We wish to compare the effect of an analgesics with no analgesics on pain experienced during a minor surgical procedure. We will measure pain experienced in a 3 point scale (0=none, 1=mild pain, 2=severe pain). We will consider the analgesic effective if the response is as good as or better than that set out to test is as shown above and to the left. Without analgesics (column 2, control), we anticipate 5% to have no pain, 80% moderate pain, and 15% with severe pain. With analgesics (column 1, intervention), we hope 30% will experience no pain, 65% some pain, and 5% severe pain. The borders as calculated are shown above and to the right. We decided to recruit suitable subjects from the surgical list, randomize participants to receiving or not receiving the analgesics, and obtain their response at the end of the operation. We planned to review the data on a weekly basis. As the test is 2 sided, two triangles, one for treated>controls, and the other for control>treated. At the first review after 1 week, there were 5 treated subjects, 2 (40%) had no pain and 3 (60%) had moderate pain. There were also 7 control subjects, none (0%) were pain free, 5 (71%) had moderate pain and 2 (29%) had severe pain. (V=0.6 , Z=-1.5). The resulting plot has crossed the inner border of the upper triangle, and at this point the conclusion those treated had no greater pain than the control cases could be drawn. However the plot was still within the borders of the lower triangle, so no decision could be made as to those treated had less pain. At the second review after 2 weeks, there were now 13 treated cases, 3 (23%) were pain free, 9 (69%) moderate pain, and 1 (8%) severe pain. There were also 13 control cases, none (0%) were pain free, 10 (77%) had moderate pain, and 3 (23%) severe pain. (V=1.3 , Z=-2.1). The Triangular Test plot however remained within the lower triangle, so more data needed to be collected. At the third review after 3 weeks, there were now 19 treated cases, 8 (42%) were pain free, 10 (53%) with moderate pain, and 1 (5%) with severe pain. There were 18 control cases, 1 (6%) was pain free, 12 (67%) had moderate pain, and 5 (17%) severe pain. (V=2.3 , Z=-4.3). The Triangular Test plot now crosses the outer border of the lower triangle, so the study can terminate, and the conclusion drawn that those receiving the analgesics had significantly less pain. The terminal analysis at the end of the second week showed effect size(Z/sqrt(V))=2.8407 p= 0.002. The sample size at that time was 37, less than the 55 maximum required but 2 more than the 35 required for a fixed sample size study. This shows that, although the averaged sample size required for the Triangular Test is less than that in a fixed sample size study, there are circumstances when the same or greater sample size will be used. Also, when the study is reviewed, the Triangular Test plot at the end of the second week was so close to statistical significance that an argument can be made to break protocol, and make the third review sooner. Had this happened, a significant result using a smaller sample size might have been achieved. Input Survival rates were initially used to define survival from cancer at a specified time after diagnosis or commencement of treatment. The related statistics however are applicable to any time related events. Number of time intervals is the number of intervals of time that has elapsed at the time survival rate is evaluated. For example, in cancer, the 5 year survival rate uses a year as the time interval, and the rate is evaluated after 5 intervals of time (5 years). In testing the quality of light bulbs, the 100 hours survival rate (where the light bulb has not as yet burnt out) uses an hour as the time interval, and the rate is evaluated 100 hours after the light bulb is switched on. In testing a contraceptive, the survival rate (not pregnant) uses a month or menstrual cycle as the time interval, and the rate (proportion not pregnant) is evaluated after two years (24 months or cycles). The statistical analysis takes into consideration that, at a particular evaluation, all the cases have not been in the study for the same period of time, and the event of interest (death, burnt out, pregnancy) occurs at different times. The data is therefore said to be censored. The columns are the number who died (the event of interest has occurred) and the number who survived in group 1, followed by the same for group 2, for that time interval in that review. The current 3 year survival rate for a particular cancer is 30% (0.3). We wish to compare the survival rate between the current treatment (control) and the use of a new drug (Tmt). We will accept the new drug to be better if it can improve the 3 year survival rate to 50% (0.5). We designate α=0.05, power=0.8, the two survival rates to compare as 0.3 and 0.5, and the number of intervals = 3 for 3 year survival rate. We will allocate equal numbers to the two groups so that the ratio = 1. The borders as calculated are shown above and to the right. We decided to recruit suitable subjects for the study. We will perform the first review 3 years after the start of the study, then repeat the review on a yearly basis. Rows 1, 2, and 3 are 3 years of death and survival at the first review. In control group, there were a total of 33 cases, 3 died and 30 survived year 1. In treatment group, there were a total of 23 cases, 2 died and 20 survived year 1. In treatment group, of the 20 that survived, 14 died or survived year 2. Six cases were either lost to follow up or had been in the study less than 2 years but had not died, and therefore not counted. Of these 14, 4 died and 10 survived. In control group, of the 20 that survived years 2, 16 died or survived in year 3. Four cases that were either loss to follow up or had been in the study less than 3 years but had not died, so were not counted. Of these 16, 5 died and 11 survived. In treatment group, of the 10 that survived year 2, 8 died or survived year 3. Two cases that were either lost to follow up or had not been in the study for 3 years but had not died, and so were not counted. Of these 8, 2 died and 6 survived. Rows 4, 5, and 6 are the accumulative 3 years survival figures at the second review. The numbers consists of all the records of the first review, and what happened to those that survived since, plus all the new cases that have entered the study. In control group, the accumulated data now showed 48 cases, 15 new cases added to the 33 that were present at the first review. Of these 48, 8 died 40 survived. The 8 deaths were 3 from the first review, plus another 5 from the new cases. In treatment group, the accumulated data is now 50 cases, 27 new cases added to the 23 that were present in the first review. Of these 50, 5 died and 45 survived. The 5 deaths included the 3 from the first review, plus another 2 from the new cases. In control group, of the 40 that survived there were 37 that died or survived year 2. These included new cases that joined the study since, plus some of the old cases that have now died or survived year 2, minus those loss to follow up or not have been in the study for 2 completed years but had not died, so were not counted. Of these 37, 12 died and 25 survived year 2. The 12 deaths included the 6 who died in year 2 of the first review, plus another 6 new deaths. In treatment group, of the 45 that survived year 1, 42 died or survived in year 2.These included new cases that joined the study since, plus some of the old cases that have now died or survived year 2, minus those loss to follow up or not have been in the study for 2 completed years but had not died, so were not counted. Of these 42, 10 died and 32 survived year 2. The 10 deaths included the 4 that died in year 2 during the first review, plus another 6 new deaths. In control group, of the 25 cases that survived year 2, there were 23 cases that died or survived year 3. These included new cases that joined the study since, plus some of the old cases that have now died or survived year 3, minus those loss to follow up or not have been in the study for 3 completed years but had not died, so were not counted. Of these 23, 8 died and 15 survived. The 8 deaths included the 5 that died during the first review, plus another 3 new deaths. In treatment group, of the 32 that survived year 2, 29 died or survived in year 3. These included new cases that joined the study since, plus some of the old cases that have now died or survived year 3, minus those loss to follow up or not have been in the study for 3 completed years but had not died, so were not counted. Of these 29, 9 died and 20 survived year 3. The 9 deaths included the 2 that died in the first review, plus another 7 new deaths. At the second review, the calculation is that survival rate in the control group is 0.37, and in the treatment group 0.47, v=12.8 and z=-4.3. Rows 7, 8, and 9 are the 3 years survival figures at the third review. The numbers consists of all the records of the second review, and what happened to those that survived since, plus all the new cases that have entered the study. In control group, the accumulated data now showed 80 cases, 32 new cases added to the 48 that were present at the second review. Of these 80, 20 died 60 survived. The 20 deaths were 8 from the first and second reviews, plus another 12 from new cases. In treatment group, the accumulated data is now 70 cases, 20 new cases added to the 50 present in the second review. Of these 8 died and and 62 survived. The 8 deaths included the 5 from the first and second reviews, plus another 3 from the new cases. In control group, of the 60 that survived there were there were 56 that died or survived year 2. These included new cases that joined the study since, plus some of the old cases that have now died or survived year 2, minus those loss to follow up or not have been in the study for 2 completed years but had not died, so were not counted. Of these 56, 16 died and 40 survived year 2. The 16 deaths included the 12 who died in year 2 of the first and second reviews, plus another 4 new deaths. In treatment group, of the 62 that survived year 1, 52 died or survived in year 2. These included new cases that joined the study since, plus some of the old cases that have now died or survived year 2, minus those loss to follow up or not have been in the study for 2 completed years but had not died, so were not counted. Of these 52, 11 died and 41 survived year 2. The 11 deaths included the 10 that died in year 2 during the first and second reviews, plus another 1 new death. In control group, of the 40 cases that survived year 2, there were 35 cases that died or survived year 3. These included new cases that joined the study since, plus some of the old cases that have now died or survived year 3, minus those loss to follow up or not have been in the study for 3 completed years but had not died, so were not counted. Of these 35, 15 died and 20 survived. The 15 deaths included the 8 that died during the first and second reviews, plus another 7 new deaths. In treatment group, of the 41 that survived year 2, 36 died or survived in year 3. These included new cases that joined the study since, plus some of the old cases that have now died or survived year 3, minus those loss to follow up or not have been in the study for 3 completed years but had not died, so were not counted. Of these 36, 11 died and 25 survived year 3. The 11 deaths included the 9 that died in the first and second reviews, plus another 2 new deaths. At the third review, the calculation is that survival rate in the control group is 0.31, and in the treatment group 0.48, v=20.0 and z=-10.6. At this point, the sequential line crosses the significance line, and the study stops with the rejection of the Null Hypothesis. The survival rates in the 3 review periods are shown in the table to the right, and the sequential plots are as shown in the diagram to the left. At the first review after 3 years, the 3 year survival rates were 48% and 47% for the control and treatment groups. (V=5.3, Z=0.7). The Triangular plot has not crossed any of the borders, and the only decision possible is to continue with the study. At the second review 1 year later, the 3 year survival rates were 37% and 47% for the control and treatment groups. (V=12.8, Z=-4.3). The Triangular plot has now cross the inner border of the upper triangle, so that the decision that group 1 survival rate is not significantly greater than group 2 can be made. However, no decision can as yet be made whether survival rate in group 2 is greater than group 1. The decision is to continue with the study. At the third review 1 year later (5 years after the start of the study), the 3 year survival rates were 31% and 49% for the control and treatment groups. (V=20.0, Z=-10.6). The Triangular plot has now reached the outer border of the lower triangle, so the study can be terminated, and the conclusion that the new treatment (group 2) offers a higher 3 year survival rate than control (group 1) can be made. The terminal analysis at the end of the second week showed effect size(Z/sqrt(V))=2.375 p= 0.0088. The sample size is difficult to state, as subjects entered and remained in the study for different periods of time. However there were 80 control and 70 treated in the study, a sample size of 150, in excess of the 71 calculated for a fixed sample size study.